This little pouch designed by Cathy was inspired by a visit to India where 'Zari' embroidery using metallic wire on black velvet, has a long history. We are using black cotton velvet, copper wire & colourful threads, with a choice of a pure silk checked lining or liberty print* The completed pouch measures 15 cm x 10 cm and would make a lovely gift. *Please note that there is a limited amount of silk checked lining remaining, therefore some materials packs may contain liberty print fabric. Suitable for beginners and enthusiasts alike. After transferring the pattern onto the black cotton velvet, you will outline the design using copper wire, before working various filling stitches using stranded embroidery cotton in striking colours. 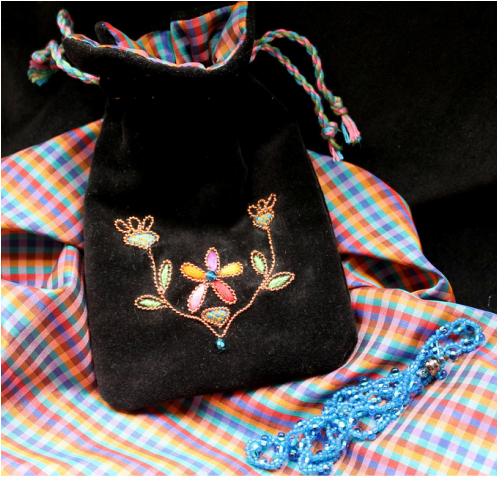 We aim for you to part-complete the design by the end of the workshop and feel confident to complete the project at home.You will be given full details and materials about how to complete the jewellery pouch.